UCF alumna Simona Ceriani today published a new study that finds sea turtles are what they eat – but where they eat may be even more important. Ceriani, who is a tenured research scientist with Florida Fish and Wildlife Conservation Commission, collaborated with three UCF Department of Biology researchers on the study, published in Scientific Reports . During a nine-year period, the scientists examined chemical signatures of more than 700 loggerhead turtles, which nest at the Archie Carr National Wildlife Refuge south of Melbourne. Coupled with GPS tracking, the team was able to map the signatures across the western Atlantic Ocean from the waters off Nova Scotia to the Yucatán. Florida is one of the major nesting grounds for loggerhead turtles in the United States. The Carr refuge accounts for 14 percent of the loggerhead nests in the northwest Atlantic, which is the largest subpopulation in the world. The study showed that most Carr female loggerheads do not leave the coastal waters that fall under the U.S. jurisdiction. However, the foraging areas where the refuge nesters migrate from vary from year to year. Turtles spend 99 percent of their time in the water, so tracking their whereabouts can prove difficult. The chemical analysis costs $10 per turtle compared to $2,000 to $5,000 required for individual GPS tracking. “We need to know where they go so that we can protect them, if they need to be protected,” Ceriani said. As a result of the study, conservation biologists such as Ceriani, will look at two key locations to protect sea turtles: the waters off eastern Central Florida and the waters of Andros Island in the Great Bahama Bank. The turtles that forage in the Bahamas produce more hatchlings than those who forage in the waters near the mouth of the Chesapeake Bay. For Ceriani, this research had special meaning. 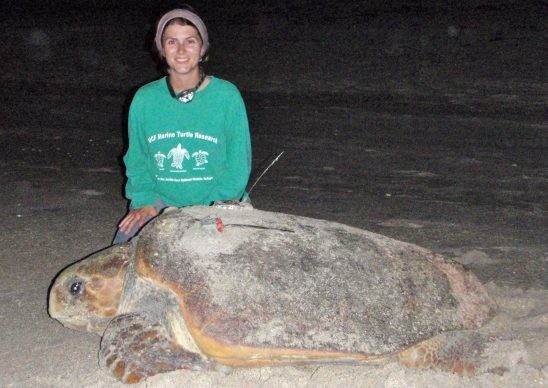 She graduated in 2014 with her Ph.D. in conservation biology from UCF, and now three years later she has significantly extended her doctoral research as the coordinator for Florida’s sea turtle nesting program. A position she took just two months after graduating. It was also an opportunity to work once again with researchers from UCF. The study was a result of a collaboration with biologists John Weishampel and Kate Mansfield and retired biologist Llewellyn Ehrhart. Michael Wunder of the University of Colorado, a specialist in the analysis of stable isotopes, was also a key member of the team. “It was amazing working with John and Llew who were both of my committee co-chairs and I owe a lot to them both professionally and personally,” Ceriani said. Next on her to-do list: a trip to the Great Bahama Bank to investigate the results in the field. She will apply the techniques used in this study to her next one, to continue to unravel the complexity of Florida sea turtle migratory patterns.